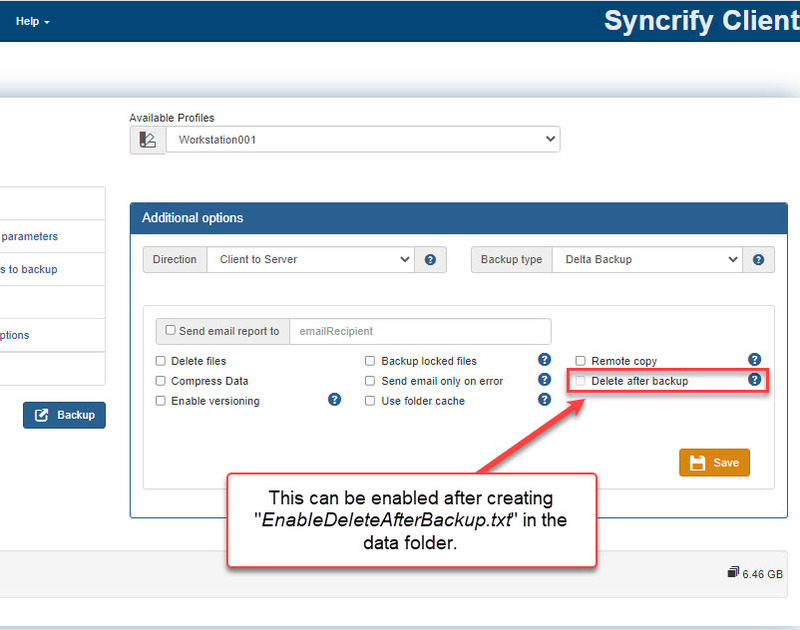 When this option is enabled, Syncrify will delete files on the client after they have been successfully backed up. This option is only valid when the backup direction is Client-to-Server. It has no affect when the backup direction is Server-to-Client or Two-way sync. File on the client are only deleted if they have been successfully transferred to the other side. Moreover, if the Delete File option is checked, it will get disabled. Enabling this option can be very dangerous since it has the potential of deleting important files from the machine. As an added precaution, this option is disabled in Syncrify by default. In order to enabled this option, you must follow the steps below. Create a new Text file called EnableDeleteAfterBackup.txt in this folder. Contents of this text file does not matter. You can leave it empty. As long as Syncrify sees this file in this folder, this option gets enabled. Finally, check the Delete after backup box. In older versions of Syncrify you will have to click the More button under the Advanced tab to enable this option.